After taking a hiatus last year, Bazooka Rocks is back to defend pop punk with a solid bang, as PULP Live World is set to bring fans BAZOOKA ROCKS V on June 24-25 at the SM Skydome, SM North EDSA. 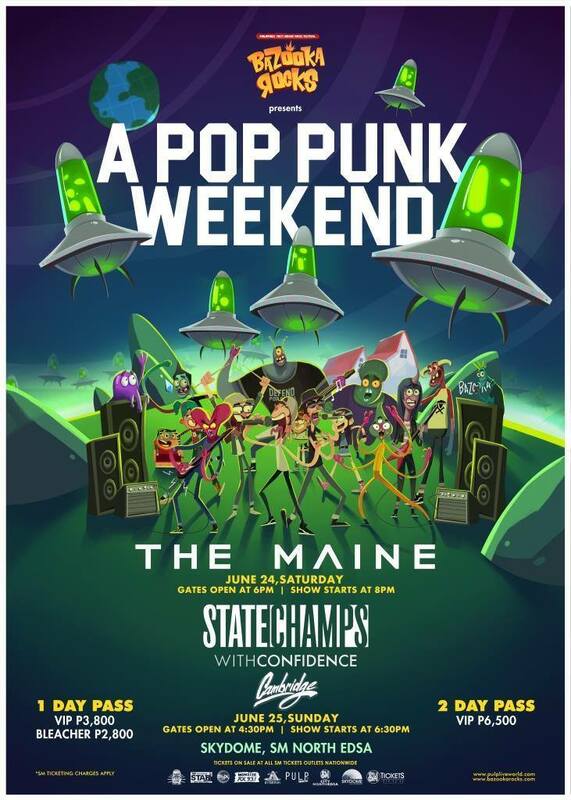 Where the previous Bazooka Rocks events followed a festival format, Bazooka Rocks V offers a back-to-back showcase of two of the biggest names in the scene today — The Maine and State Champs. Filipino fans of The Maine can indulge in being some of the most spoiled fans in the country once again, as this is the sixth time the Arizona locals will be performing in Manila, following their appearance with All Time Low back in 2015. They'll be rocking the first night of Bazooka Rocks V on June 24. Meanwhile, this will be State Champs' first time to perform in the country. The New York-based pop punk band was formed in 2010 and gained a huge international following prior to the release of their sophomore album Around the World and Back in 2015, prompting many Filipino fans to ask PULP to bring them over for Bazooka Rocks IV. Now, these fans are finally getting their wish granted as the boys make it to the Bazooka Rocks V stage on June 25. Update: Aussie band With Confidence will return to Manila to join State Champs at Bazooka Rocks V. Sydney's Cambridge will also be joining them on the 25th. Tickets go on sale on February 1, 2017, 10 am at all SM Tickets​ outlets nationwide and on www.smtickets.com. Tickets may also be purchased at PULP HQ.